This project got its start whenI recieved a copy of Digital Images Video "Simple Drivetrain Projects"hosted by Alan Olsen for my birthday. 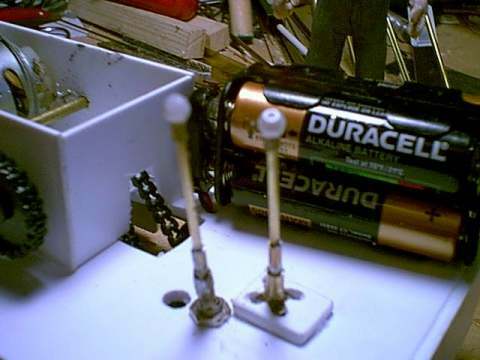 Right off the bat the videoexplained on how to build a simple operating mechanism using Delrin sprocketsand chains to reduse the speed and increase the power of an electric motor. I orded some goodies from Servolinkand away I went. 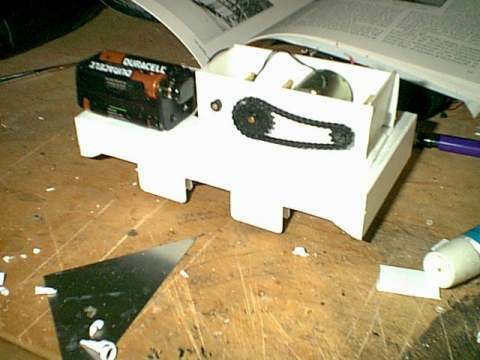 Winky's gearbox, note motor speed is reduced 4 timeswhile being trannsmitted to the axle. It took some time for me to find a prototype to buildusing this method of power, but finally I stumbled across just what I waslooking for in a back issue of Light Iron Digest (A publication I heartilyreccommend to anyone with an interest in light railways.) It it therewere plans for Bobber Gibb's 1949 Cranberry Special Brookville locomotive"Winky." Just what i had been looking for! 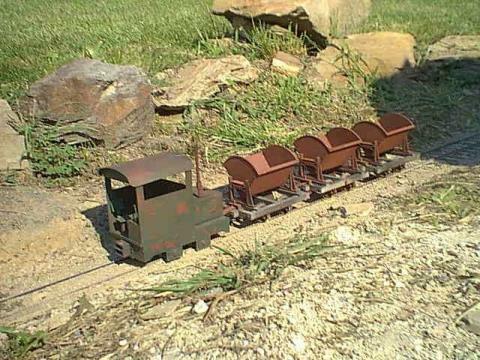 i didn;t set outto build an eact scale model, but I did want to catch the spirit of thisdimunitive loco. First of all, I built the gearbox. Construction was fairly straightforwardand even easier than I thought it would be. 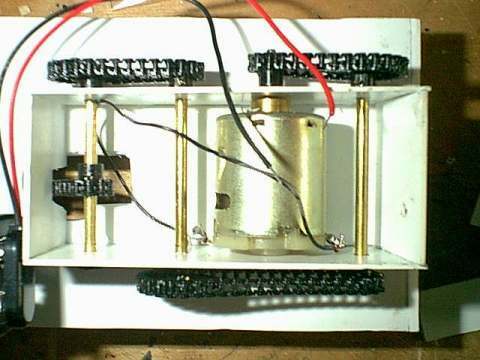 The motor is an itemI picked up at Radio Shack and the axles are made from K&S brass rod. The sides of the gearbox and the bottom are made from .040 styrene. ( I love styrene). The chasiswas made by cutting the deck from .1 styrene and making a subframe to holdthe wheelsets from the same material. Incidentally the wheelsetswere el Cheapo Bachmann plastic items (no frills here!). After constructing and mounting the gearbox, someform of power and control was necessary. I opted for battery powerin the form of 4 AA alkalines and controls featured are an on off switchdiguised as a gearshift, and DPDT switch cleverly disguised as a reversinglever (clever donchathink?) The batteries were hidden in the fuel tank,after the first couple of test runs I reduced the cells to a pair of AAsto give a more prototypical speed. As you can see in the picture,the levers are made up of brass rod and tubing, that fit over the togglewith a pearl bead on the end to simulate the knob. Other controlsare in the cab, but are non functional. peeled off the rubber cement makingthe nice "peeling paint" effect. a little mist of grey and flat blackspraypaint blended the colors together, and gave it that "years of service"look. 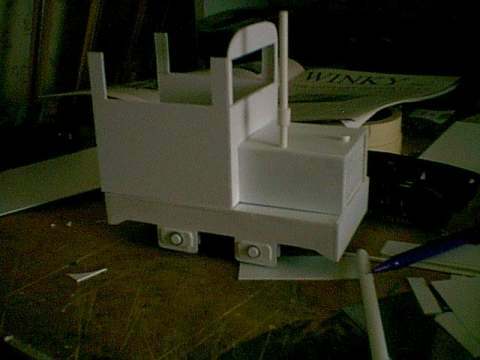 I then soldered up a couple of pins for the link and pin couplers,and put her to work outside toting tipper cars. To date, she canshuttle back and forth all day with three tippers on one set of batteries. I have to say I'm really happy with it!